Would you like a few more ideas to use up the last of your tomato bounty? In medium sauce pan over medium heat add extra-virgin olive oil, white onion, and garlic cloves. Cook for 7 minutes then, add 1/3 of the tomatoes, and continue to cook. In the meantime in a small food processor combine remaining tomatoes, and basil leaves. Pulse until well combined. Add tomato and basil puree to sauce pan and cook until heated through. 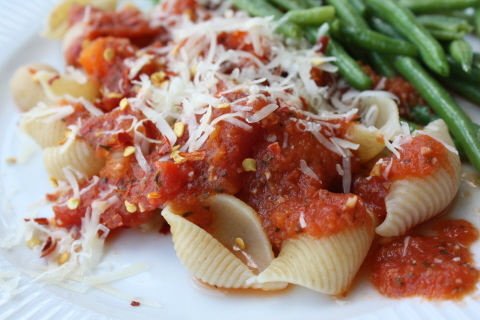 Serve over pasta, or protein of your choice. Garnish with freshly grated parmesan and ground pepper.